Oh damn haha. Ill stick with if nainggolan then as he was my original thought. Just buy him Monday, try for 2 days and at the very worst sell for a minimal loss maybe ? I bought him Thursday evening to flip him Friday morning. Still played him a little and really liked him personally as an LCM in a BBVA Team. I've used the NIF for over 250 matches and I've used the IF for around 5 matches so far. He's really good with maestro chem style and if you use him properly. The thing is that you want to pair him with someone who can win tackles. I use him with Matic or Ramires, so that he can be free to thread passes and really help with the buildup. Because if you pair him with a Schweinsteiger for example, I have noticed he just sits in midfield and doesn't do much. I snapped one up for 160k and am not bothered that I will lose coins because he is my playmaker in midfield. I packed the IF in an untradeable pack. Used him in my fitness team yesterday before I sold them all lol he was alright. Didn't feel much different from his NIF. Guess he'll be a permanent fixture on my bench. I picked one up earlier for 130k. Gonna hold and sell later on for a profit (hopefully). I got if nain and will prob use him instead. Ill post a team pic in a second. I like this center destroyer bookended by all arounders. Im think fab isnt as well rounded as id like. Wow, nice squad man! And yeah, just give him a try. He really is a good CM. Thanks! I def will . 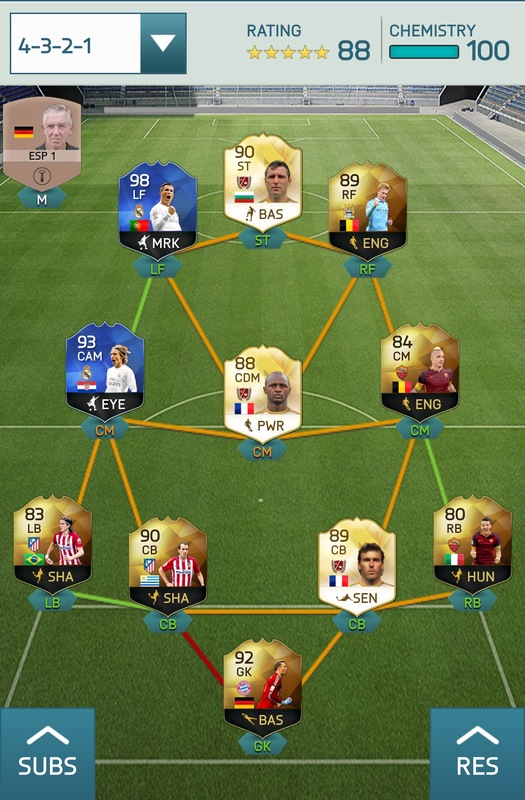 I just need tots godin to complete it.